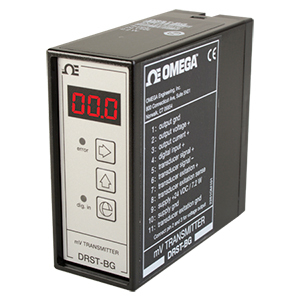 Brand New DRST-BG MV Signal Transmitter converts bipolar mV signals from transducers supplied directly by the device to standard current/voltage signals. DRST-BG is suitable for load cell application as well as other applications such as tank filling and draining, weighing with a taring function, measurement of cable tensile force, level control, signal conversion/amplification. A multifunction user interface consisting of three push buttons and a 3-digit LED display for programming. • The analog input can be programmed for voltage in the range -40 to 100 m Vdc. • The digital signal can be selected as either NPN or PNP. Taring can either be by way of the digital input or from the front interface. • The analog output can be programmed to current in the range 0 to 20 mA or voltage in the range • Short circuit protected transducer supply which can be programmed to 5 to 13 Vdc from the front. • Sense input (with transducer supply used) for compensation for cable resistance to the transducer. • Mounting for a standard 11-pole socket which can be adapted for DIN rail or plate.